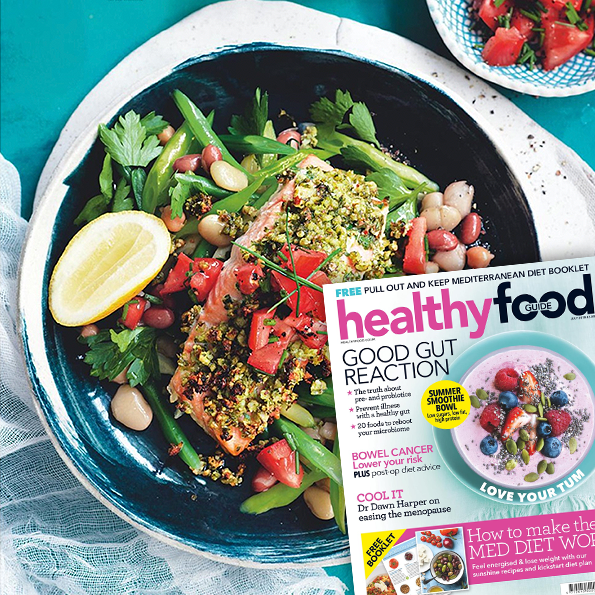 Have your most energised summer yet with these fab tips plus a delicious salmon recipe courtesy of Healthy Food Guide. Ditch the junk – Preparing meals from scratch is the ideal, but it isn’t always practical. So if you must eat something readymade make sure it’s on the healthier side, and If the ingredients list isn’t clear and concise (as in, you’ve never heard of most of it) then it’s probably processed and therefore not good for your body. Drink plenty of water – Feeling bloated? Then drink more. It seems like a contradiction, but water retention is actually caused by too much sodium in your body which can only be flushed out by good old h2o… so get glugging! Spice up your salad – Salads are the ideal meal for the hot weather and can actually be satisfying, flavoursome and nourishing. The key is to build the meal around a good protein (chicken breast, boiled egg, fish or tofu) and then get creative with flavours. This almond-crusted salad with bean salad and salsa is the perfect example of a hearty, tasty but super healthy summer supper. Trust in the power of protein – If you’ve been counting on carbs to get you through the day and are plagued by weight gain, energy slumps and general feelings of meh-ness, then it’s time to put your faith in protein. Whether avocado, nuts, eggs, fish, lean meat or protein shake, its important to have a little at every meal to maintain energy. Don’t go hungry – They used to say snacking was bad (gorging on Jammie Dodgers at 4pm isn’t the best idea…) but actually eating small meals is a great way to maintain blood sugar throughout the day, helping you feel satisfied, full of energy and never ever prone to hunger. Just make sure you’re eating the good stuff and you’ll feel fab. Find food inspiration with a subscription to Healthy Food Guide and save up to 56% off of the cover price.